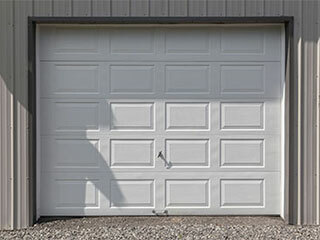 Your garage door is an important and well-used appliance, so it’s vital to ensure it is running properly and safely. There are a few basic tests you can perform on the door and if you have any issues, you can contact our professionals for advice. Your garage door opener includes two sensors that are located on either side of the opening. These sensors communicate with each other with an infrared beam. If something obstructs the beam while the door is closing, the door reverses to prevent injury or damage to whatever is in the way of the beam. If your door doesn’t have these sensors, it’s time to get a new opener. The sensors should be mounted no higher than six inches off the ground, to ensure a child or pet can’t be under the sensors and risk injury. Check them regularly to ensure they aren’t dirty, blocked, or misaligned. To test them, block one with an object over six inches tall. Press the wall button or remote to close the door. It should not close, but the bulb on the opener should flash. If the door does close, it requires a service call from a trained technician. This is important to get fixed immediately, as a door that closes with something in the way can cause serious injury. The second test you can perform is the reverse function. With the door open, place a block of wood on the floor under the door. Press the wall button or remote to close the door. The door should begin to close but then reverse as it nears the object. If the door closes on the object, once again a service call is necessary, and it should be dealt with immediately due to risk of injury. The final test you can perform is to check the balance of the door. Close the garage door, then disconnect it from the opener using the manual release rope. With the opener disconnected, open and close the door by hand. It should move easily with one hand, but if it sticks or binds, you may need to clean the tracks and lubricate the tracks, rollers and hinges. If it continues to stick, it’s best to arrange a service call. Finally, lift the door about four feet off the ground and release it. If the door is properly balanced, it should stay in place. If it slowly rises or falls, that’s fine, but if it slams shut or opens with force, it means the door is out of balance and requires a service call. If everything is fine with your door, re-connect it to the opener.